G UIDE IN W RITING THE L ABORATORY R EPORT. 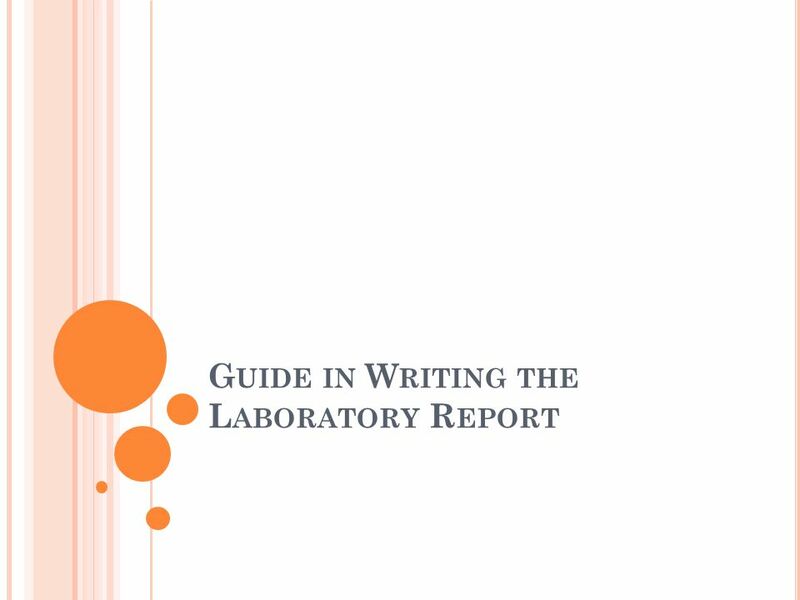 P RESENTATION The Laboratory Report should have the following content: 1. Title 2. Objectives 3. Experimental. 4 TITLE Use the title of the activity. 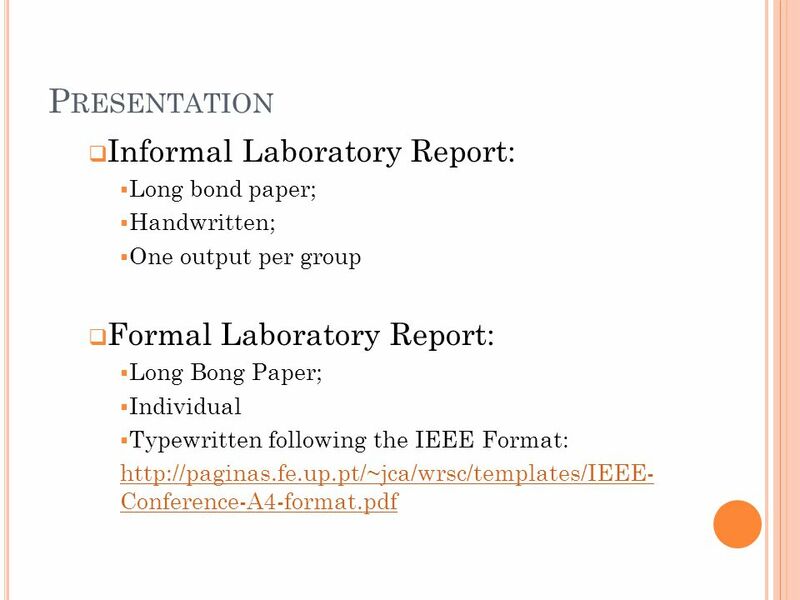 For our purposes, the title will be used to distinguish one lab report from another. 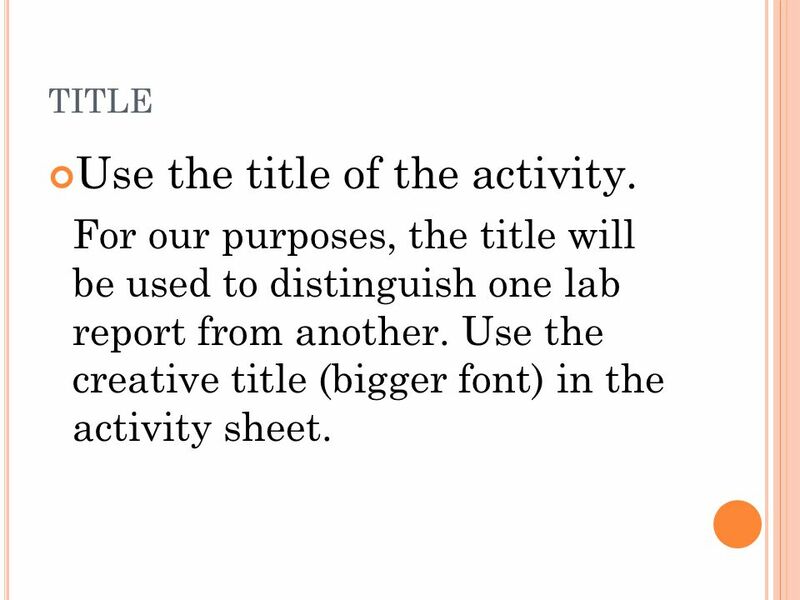 Use the creative title (bigger font) in the activity sheet. 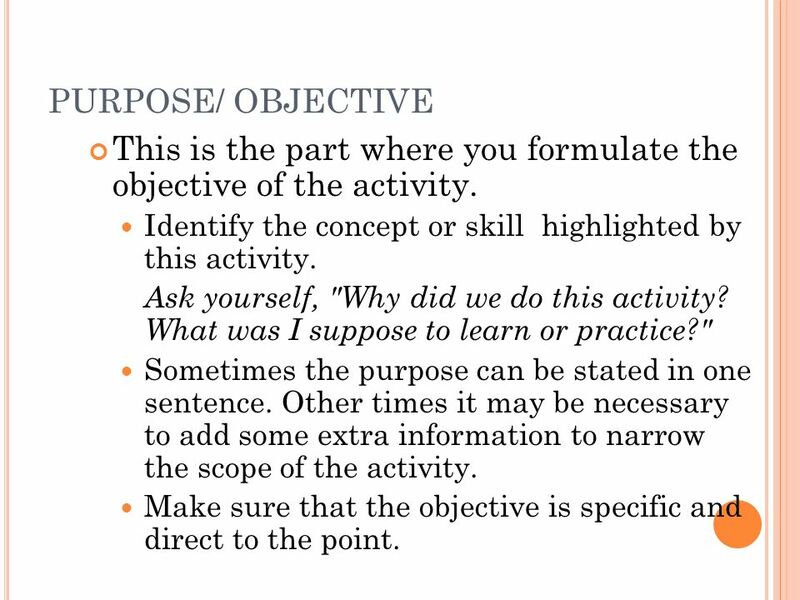 5 PURPOSE/ OBJECTIVE This is the part where you formulate the objective of the activity. Identify the concept or skill highlighted by this activity. Ask yourself, "Why did we do this activity? What was I suppose to learn or practice?" Sometimes the purpose can be stated in one sentence. Other times it may be necessary to add some extra information to narrow the scope of the activity. Make sure that the objective is specific and direct to the point. 6 METHODOLOGY/ PROCEDURE The order of events is conveyed by the sentence order in the description. Remember that your audience should be able to repeat your procedure if they wish to do so. 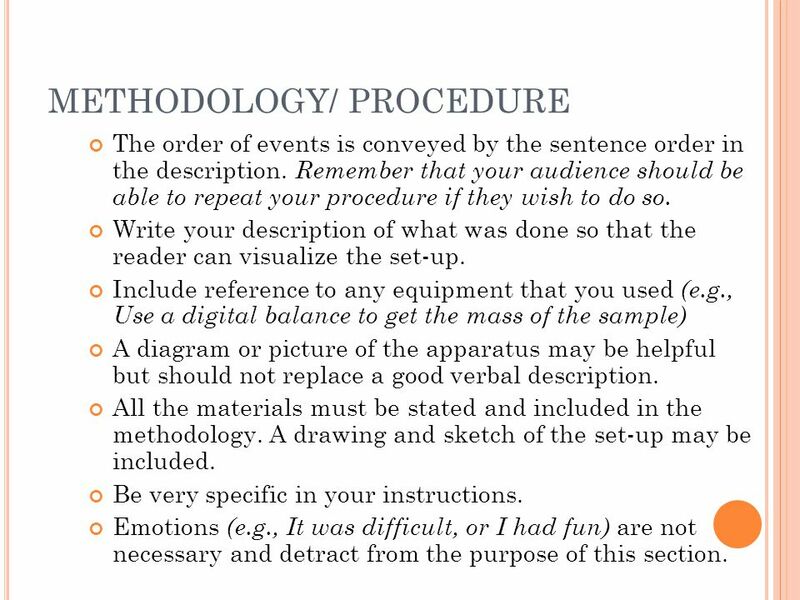 Write your description of what was done so that the reader can visualize the set-up. Include reference to any equipment that you used (e.g., Use a digital balance to get the mass of the sample) A diagram or picture of the apparatus may be helpful but should not replace a good verbal description. All the materials must be stated and included in the methodology. A drawing and sketch of the set-up may be included. Be very specific in your instructions. Emotions (e.g., It was difficult, or I had fun) are not necessary and detract from the purpose of this section. 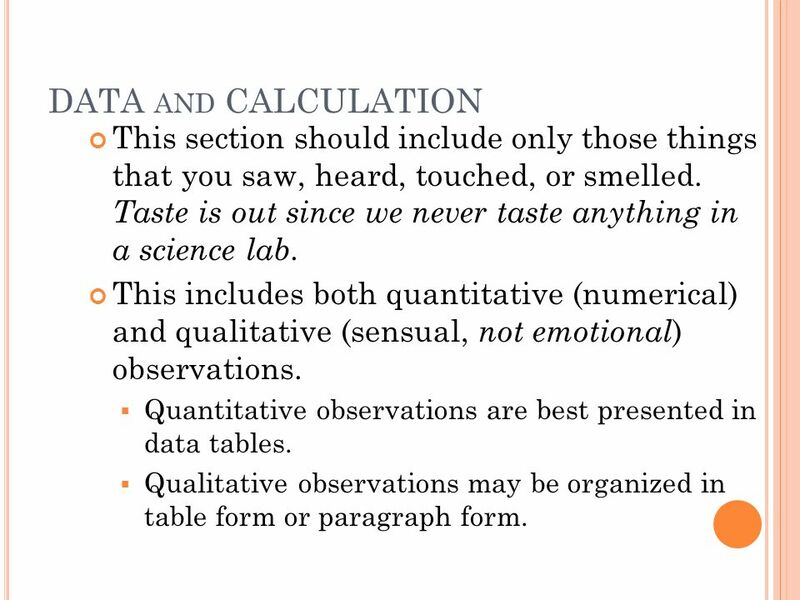 7 DATA AND CALCULATION This section should include only those things that you saw, heard, touched, or smelled. Taste is out since we never taste anything in a science lab. This includes both quantitative (numerical) and qualitative (sensual, not emotional ) observations.  Quantitative observations are best presented in data tables. 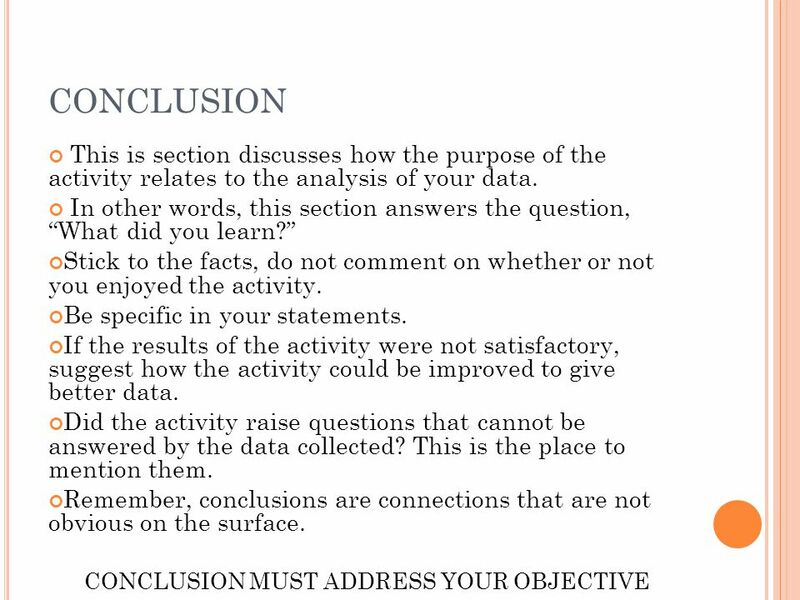  Qualitative observations may be organized in table form or paragraph form. 8 DATA AND CALCULATION Units are necessary for any measurement. 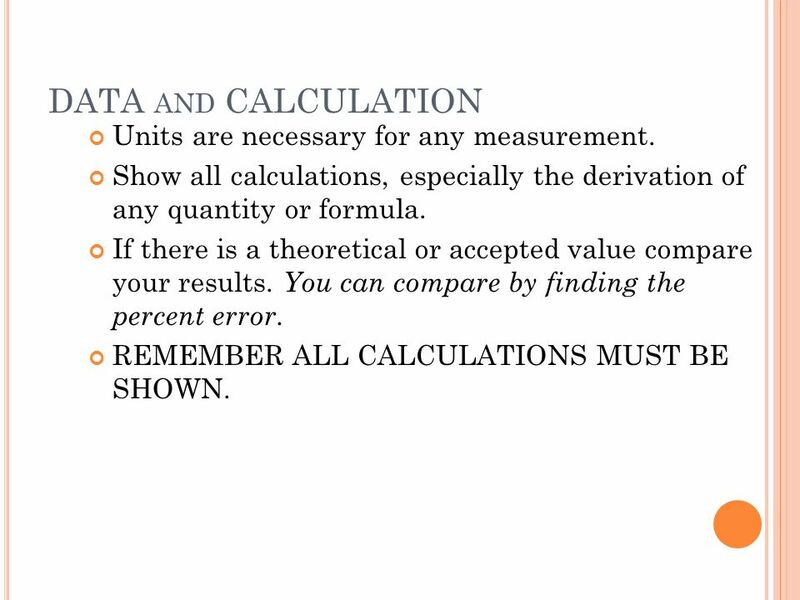 Show all calculations, especially the derivation of any quantity or formula. If there is a theoretical or accepted value compare your results. You can compare by finding the percent error. REMEMBER ALL CALCULATIONS MUST BE SHOWN. 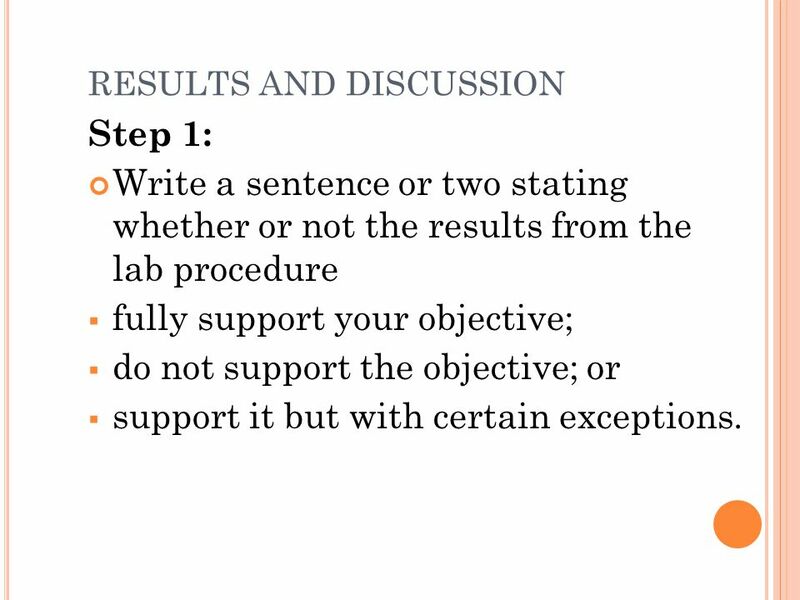 9 RESULTS AND DISCUSSION Step 1: Write a sentence or two stating whether or not the results from the lab procedure  fully support your objective;  do not support the objective; or  support it but with certain exceptions. 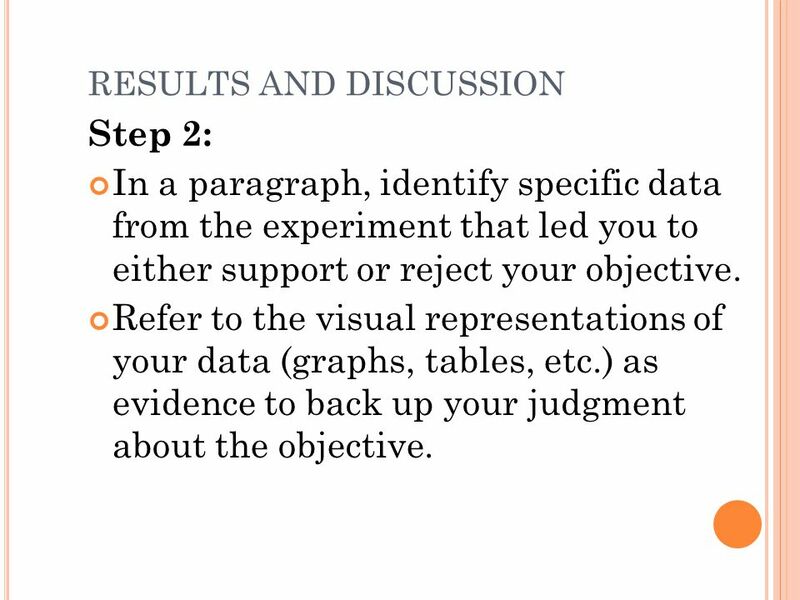 10 RESULTS AND DISCUSSION Step 2: In a paragraph, identify specific data from the experiment that led you to either support or reject your objective. Refer to the visual representations of your data (graphs, tables, etc.) as evidence to back up your judgment about the objective. 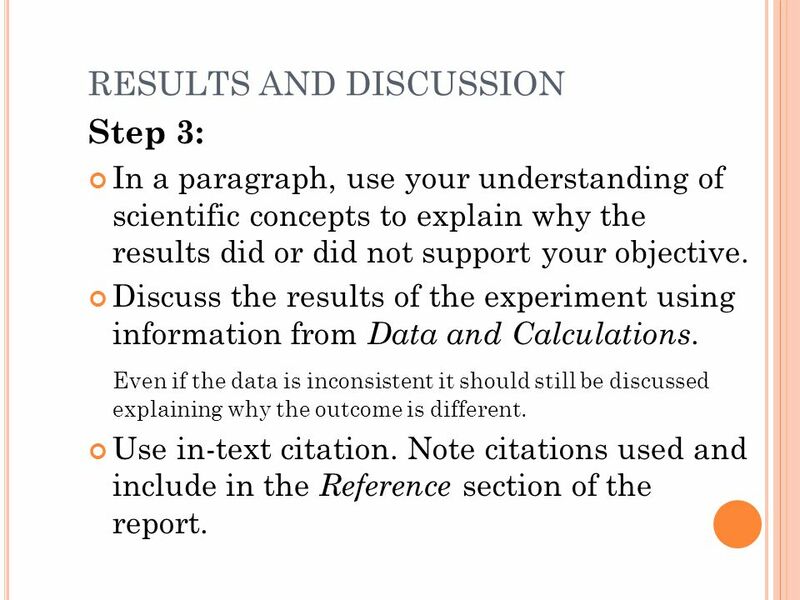 11 RESULTS AND DISCUSSION Step 3: In a paragraph, use your understanding of scientific concepts to explain why the results did or did not support your objective. Discuss the results of the experiment using information from Data and Calculations. Even if the data is inconsistent it should still be discussed explaining why the outcome is different. Use in-text citation. 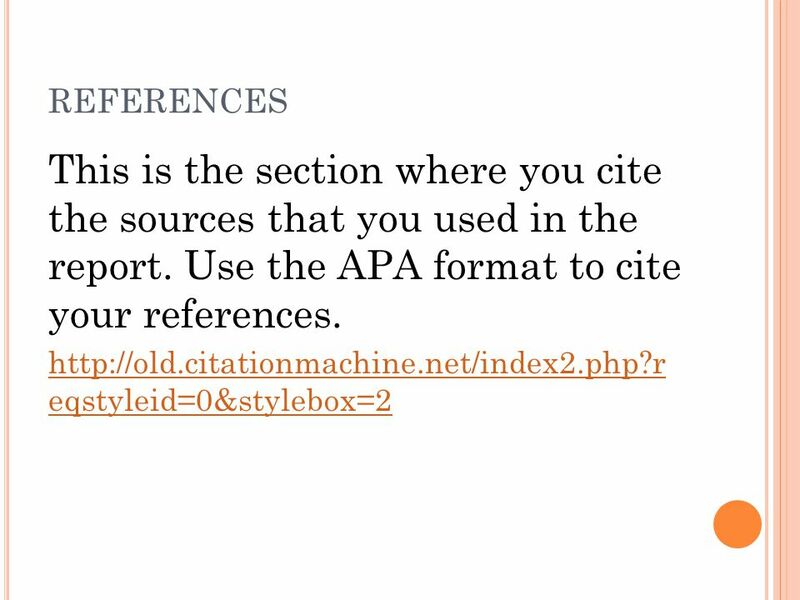 Note citations used and include in the Reference section of the report. 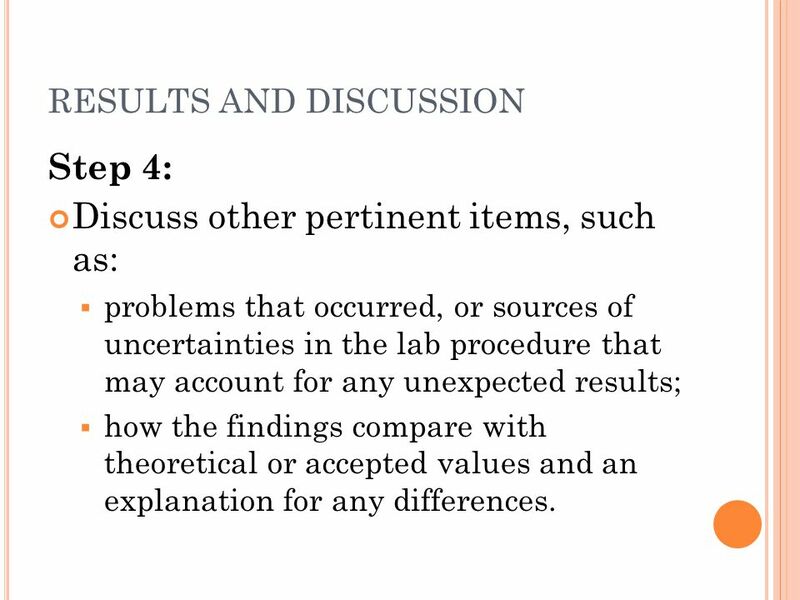 12 RESULTS AND DISCUSSION Step 4: Discuss other pertinent items, such as:  problems that occurred, or sources of uncertainties in the lab procedure that may account for any unexpected results;  how the findings compare with theoretical or accepted values and an explanation for any differences. 13 RESULTS AND DISCUSSION Remember to DISCUSS THE EXPERIMENT. 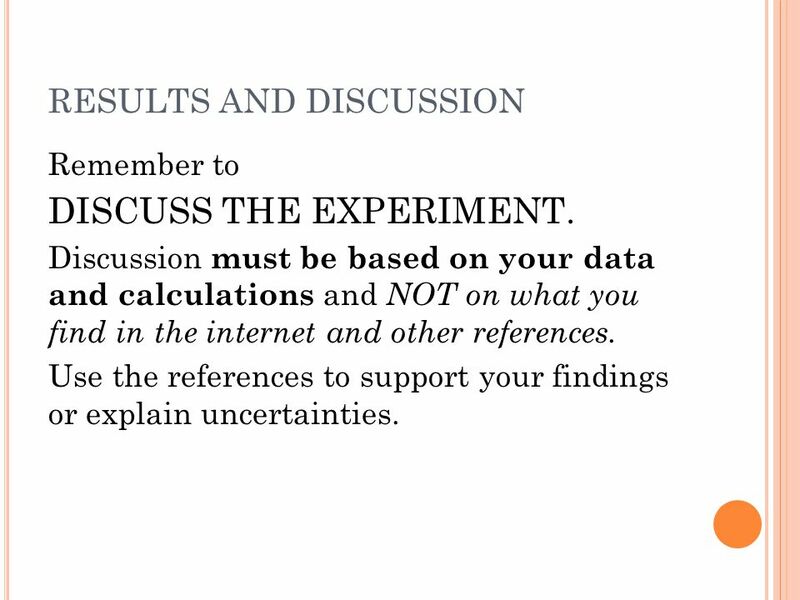 Discussion must be based on your data and calculations and NOT on what you find in the internet and other references. Use the references to support your findings or explain uncertainties. Download ppt "G UIDE IN W RITING THE L ABORATORY R EPORT. P RESENTATION The Laboratory Report should have the following content: 1. Title 2. Objectives 3. Experimental." Quantitative and Scientific Reasoning Standard n Students must demonstrate the math skills needed to enter the working world right out of high school or. Science Research Group 4 Project. Do Now: Choose One 1) List the three major kinematic equations 2) Define displacement, velocity and acceleration using complete sentences. Highlight & place your title here Highlight & write in your name here Holy Sepulcher Catholic School Grade ? Use the Student Guide to the HSS PJAS Presentation. Virginia Junior Academy of Science Presentation Overview Spring 2013. Mrs. Triemer’s “How-to” Guide Part 2. Conduct your Experiment As you do the testing, take photos that you can use later on your display board. Scientific Method Film Canister Lab. How to Make a Science Board. Key Information For your science project, you need to prepare a display board to communicate your work to others. You will. IB Internal Assessment Design. Designing an Experiment Formulate a research question. Read the background theory. Decide on the equipment you will need. By Mrs. Sinay Grade 8, Team 5 Science. * Title : Description of the lab experiment * Purpose: The “Why”? * Procedure: The step-by-step process by which. 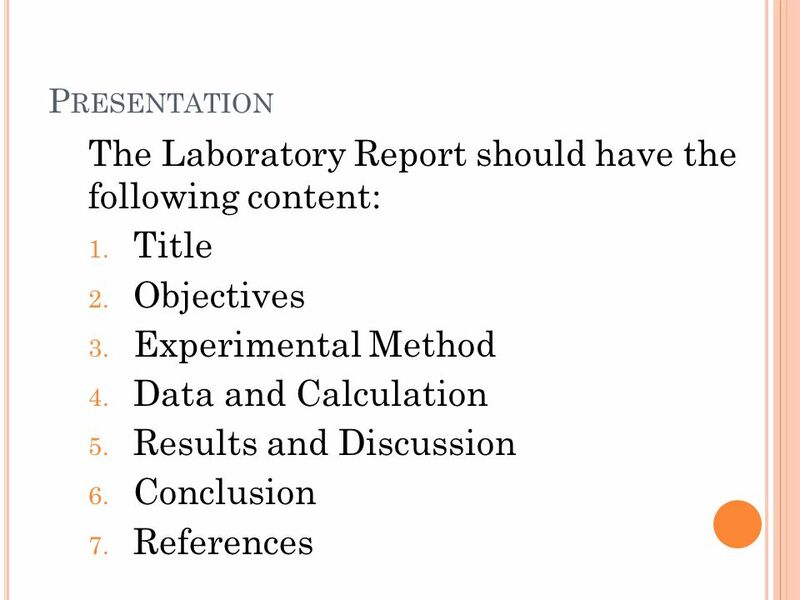 Writing for Biology Class Part 2: How to Write Each Section of a Lab Report Materials taken from Knisely, Karin. Writing in Biology Sinaur/Freeman. PowerPoint Template – delete this slide Fill in the appropriate slides Remove any bold or italicized words after you’ve added your changes Delete slides. Chapter 1 Introduction to Chemistry. Section 2 Objectives w Define chemistry & matter w Compare & contrast mass & weight w Explain why chemists are interested.